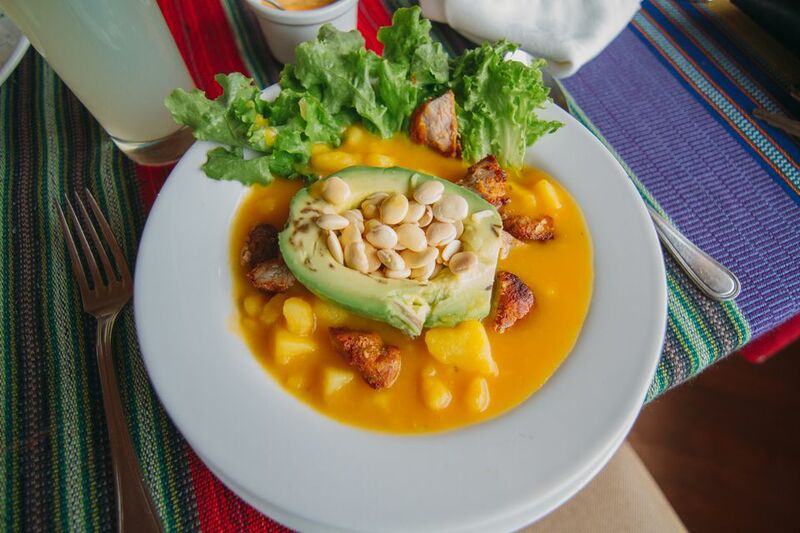 Locro de papa is a cheesy potato soup that is a staple of Ecuadorian cuisine. It's traditionally garnished with avocado and served with a spicy aji sauce. Locro de papa is simple and fairly quick to make, with basic ingredients. It's nourishing and filling―the perfect comfort food. You can add a little Aji Amarillo Paste to the sautéed onion if you like a little kick. Corn is also a popular addition (the large kernel Andean choclo corn is delicious). Melt 1 tablespoon butter and 1 tablespoon vegetable oil in a heavy soup pot. Add the chopped onion and minced garlic, and optional Aji Amarillo Paste. Sauté onions over low heat until soft, fragrant and translucent. While the onions are cooking, peel the potatoes and cut into 1-inch cubes. Set aside. When the onions are soft and golden, add 1 cup of the chicken stock. Remove mixture to a blender and process until you have a smooth puree. Set aside. Add onion liquid back to the pot with the potatoes, along with another cup of chicken stock and 2 cups water. Bring liquid to a simmer, season with salt and pepper to taste, and cook potatoes until they are very tender about 20 to 25 minutes.